Hillary Clinton changed her schedule and is back in California campaigning again. And it wasn’t just to give that policy speech in San Diego. Her words were like scuds at the presumptive GOP presidential nominee Donald Trump, of the now defunct Trump University. Clinton could have given that speech anywhere. But her presence was required in the Golden State to stave off that hard-charging Bernie Sanders. Seems like June in California has become maple syrup time for the Vermont senator. Californians, especially Asian Americans, seem to like the sweet taste. In the nation’s most Asian American state, the latest Field Poll is showing Clinton and Sanders virtually deadlocked, with Clinton at 45 percent, Sanders 43 percent. Undecideds were at 12 percent. The Field Poll had Asian Americans backing Sanders by a whopping 47 percent to 34 percent over Clinton. No wonder Hillary ditched Jersey to stump a bit more in California. California’s Asian Americans are considered to be among the most loyal Clintonites since Bill blew a saxophone in the White House. But somehow the Field Poll breakouts show an alarming demographic shift. Among Whites, at 56 percent of the electorate, Clinton has a slight 44-43 edge over Sanders, a virtual dead heat. Latinos, at 26 percent of the electorate, also give Clinton a slightly wider edge, 46-42 percent. But African Americans, at 9 percent of the electorate, give Clinton the widest margin 57-36 percent. Leave it to the Asian Americans to buck that trend. It’s a normal Asian American poll spread, with a high percentage of undecided voters, 19 percent. But with Asian Americans 11 percent of the electorate, I didn’t predict a Sanders dominance over Clinton by 47-34 percent. I recall last January when Filipino American philanthropist and activist Loida Lewis led a campaign bus tour of California to rally Asian Americans for Hillary in Southern California. Now, despite most mainstream media sentiment that Clinton is still the “presumptive” nominee, Sanders is closing in with a vengeance. And who likes him more than anyone else? Asian Americans. The Field Poll is a reputable poll. I’ve known Mark DiCamillo, the pollster, for many years, and we’ve discussed the difficulty in polling Asian Americans accurately. You have to poll in-language. You have to oversample. Even in California. I asked Mark about the big lead, and he put it in perspective. So there goes the 13 point Sanders lead? “While the poll indicates a 13-point lead for Sanders, because of the large sampling error ranges applicable to this subgroup, we really can’t say with any degree of certainty who is ahead among the state’s Asian American voters,” DiCamillo said. It might make Clinton supporters feel a bit more relaxed. But if anyone doubted Sanders’ broad appeal, a diverse state like California is proving them all wrong. The Field Poll showed Sanders is still trending, with more enthusiastic support than Clinton has. It almost begs for a side-by-side comparison. We used to call them debates. They used to have them in California. But not this year. There were debates earlier in the campaign in Iowa and Wisconsin, where there aren’t many Asian Americans, and no one talked about our issues. We were invisible and had to interpolate “Asian Americans” where we could. But on our country’s ethanol policy? It doesn’t make sense that in the state that would be the world’s seventh largest economy, none of California’s issues get raised when it matters. And the issues are pretty California-specific. Example: what’s the federal policy on the drought? But there was Trump in California’s aggie Central Valley last week declaring there was no drought in California. My brown grass doesn’t lie. 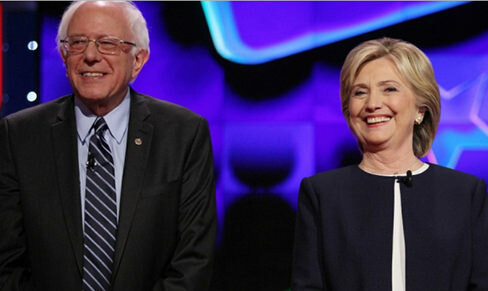 A presidential debate in California before the June 7th primary does not.